You are nature's most complex machine - a human being - and it's time to find out what you're made of. You're about to discover the secrets you keep inside as you explore the inner workings - and unlock the mysteries - of the human body. How can a bone withstand 1,000 pounds of force without breaking? Why do some people bleed more easily than others? And, how can sound be used to make blind people see? These are just a few of the mysteries you'll explore in this fascinating release from the Discovery Health Channel. Through amazing internal photography and advanced computer graphics, get an intimate look at nature's most complex machine -- from the largest organ down to the fundamental building block of life. 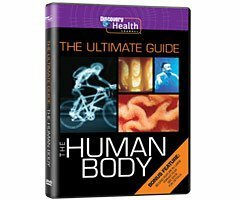 It's much more than a lesson in anatomy, it's a voyage of personal discovery.As a bonus feature, this DVD also includes the Discovery Pictures/BBC co-production The Human Body, a groundbreaking, large-format film that follows a family through a normal day to illustrate the biological processes that take place within us. With the help of thermal imaging and other cutting-edge cinematic techniques, explore the complexities of the human body in astonishing detail.